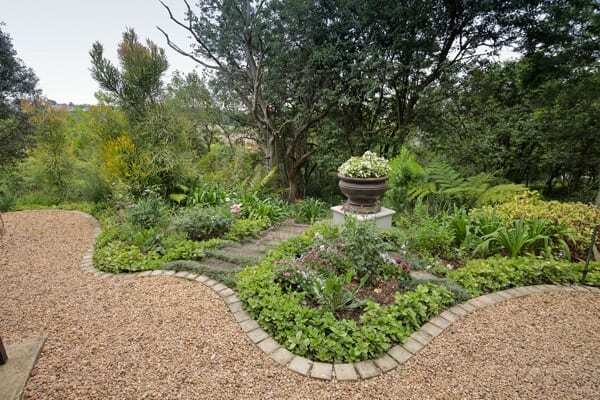 This garden mixes exotic and indigenous plants for year-round interest. 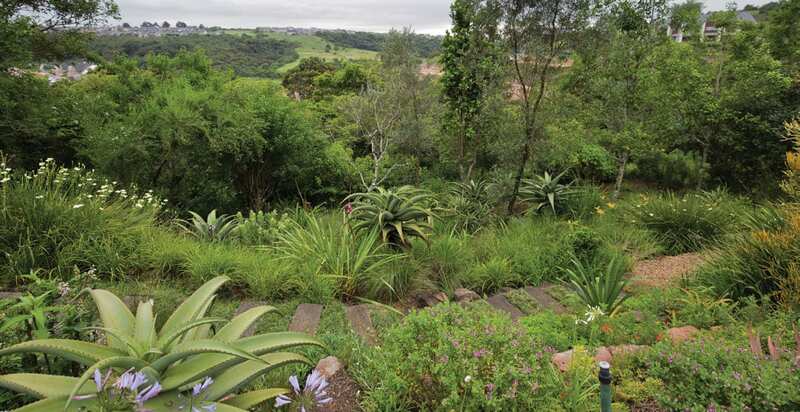 Close on eight years ago a couple swopped their home with a large, fairly level garden for a magnificent property with sloping land, uninterrupted views and a section of mature indigenous forest on a golfing estate in KwaZulu Natal. 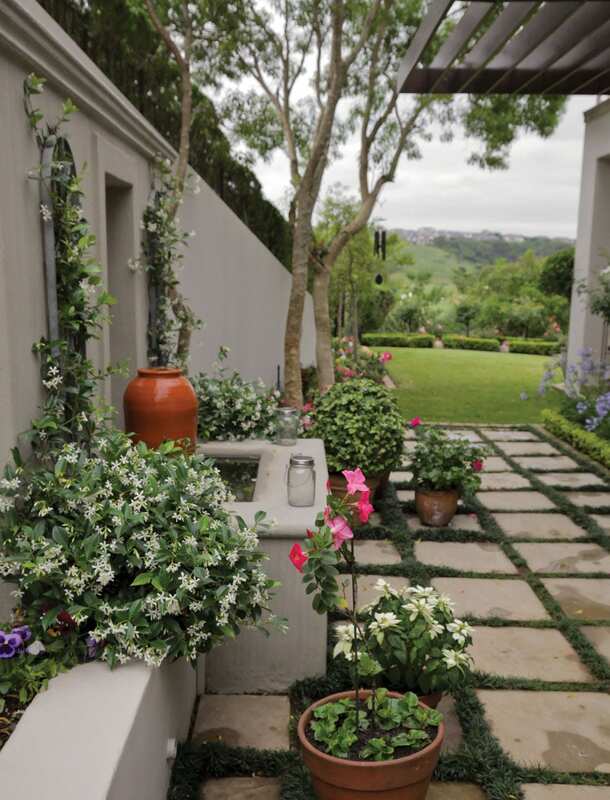 The brief to the garden designers, husband and wife team Tanya and John Keating from Tandi Landscapes, was to create a predominantly indigenous garden in keeping with the estate rules, but to include a colourful garden that included the clients’ favourite roses, close to the home. A pretty stream flanks the lower boundary of this garden, and so it was imperative from the start that the clients have safe access down to the stream, especially for when their grandchildren are visiting. The existing indigenous forest provided the perfect inspiration for a path that meanders under the shade of these mature trees and then on to traverse the hot north-facing slope to the stream below. Along the path, a series of circular seating areas in the shade allow the owners to relax and enjoy their garden on a hot day or entertain around the firepit in the evening. A mix of Plectranthus ecklonii and P. zuluensis, Rumohra adiantiformis (Knysna fern), Clivia miniata, Zantedeschia aethiopica (arum lillies) and hydrangeas create an interesting understorey in the forest. 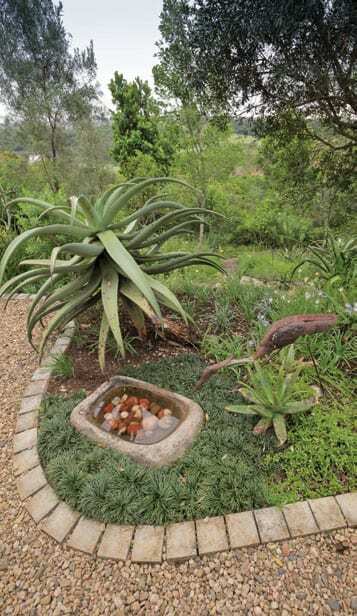 The once-hot, sparse slope below the house has become a magnet for birds, insects and other wildlife thanks to a clever mix of indigenous trees, aloes, grasses and bulbs. The owners are thoroughly enjoying the birdlife and the fact that they often identify a new bird in their garden. 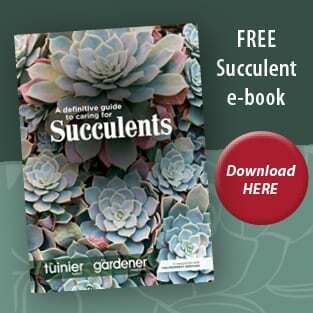 Relatively fast-growing trees such as Syzygium cordatum (umndoni), Halleria lucida (tree fuchsia), Trema orientalis, (pigeonwood) and Heteropyxis natalensis (lavender tree) are interspersed with Aloe ferox, Aloe maculata, Chlorophytum saundersiae and Aristida junciformis, while watsonias pop their heads up to add summer colour. A collection of perfumed roses such as ‘Sheila’s Perfume’, ‘Granny’s Delight’, ‘Cecile Brunner’ and ‘Crystal Fairy’, underplanted with lavender, chrysanthemums and annuals, flank the path below the rim-flow pool and on the upper level of the garden. Around the house a series of garden rooms accommodate the client’s collection of favourite herbs, an intimate seating area and a tranquil water feature that provides a focal point for the dining area. The owners now enjoy the best of both worlds with an expansive view of their rose garden against a backdrop of indigenous trees in the summer months and, when the roses enter their dormant phase, the rich, vibrant hues of the aloes on the slope below.